Find out all you need to know about triceps training, including the best exercises, training tips and strategies for building big, horseshoe-shaped triceps. Building bigger triceps is just a matter of figuring out which exercises to do, when to do them and how to implement them into your program for the best results. And that’s exactly what I’ll discuss in this triceps training guide. Radically improved triceps are as good as yours, as long as you’ve got the prerequisites for success: An appropriate plan and the willingness to consistently adhere to it. See my article on the best triceps exercises to learn how to do these exercises and their benefits. More Muscular Triceps. If you want the best possible triceps development with a profound horseshoe-like shape, then direct triceps exercises are a must. You can’t maximize the muscular potential of your triceps without them. Bigger & More Symmetrical Arms. Bigger triceps equals bigger arms. People underestimate the powerful visual impact that even relatively small triceps gains can have on upper arm size. You see, the triceps constitute a full 2/3 of upper arm mass. Yet most folks focus disproportionately on the biceps, which only make up 1/3 of the mass. Stronger Upper Body Lifts. The impact of triceps training reaches beyond just the triceps muscles. It facilitates strength gains on all upper body push exercises, including the barbell bench press and the overhead press, where the triceps play a strong secondary role. 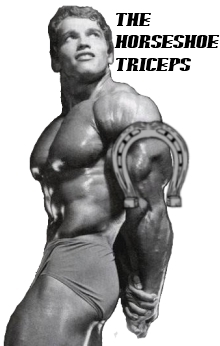 “Triceps brachii” is the anatomical nomenclature for the triceps muscle group. By breaking down and analyzing this name, which is derived from Latin, we can reveal the essential information about the triceps anatomical structure. This tells us that the triceps brachii is, quite literally, the three-headed muscle of the arm. The ‘head’ of a muscle are the origin points of the muscle. Long Head – This is the inner head of the triceps. It’s responsible for elbow extension, but also plays a role in shoulder extension and adduction. The long head gets emphasized the most when the arm is stretched overhead (or in the case of, say, cable pushdowns, when the arm is extended out/forward). Lateral Head – This is the outer head of the triceps. It is responsible for elbow extension. The lateral head is the triceps head that is most likely to lag. It is emphasized in cable triceps exercises where the bar is below the shoulder height and where the elbows can flare, such as triceps pushdowns. However, you can also emphasize the lateral head by doing a close grip bench press with the elbows flared (not recommend as this can strain the shoulders and wrists), or a dumbbell lying cross-body triceps extension. Medial Head – This is the middle head of the triceps. Much of runs beneath the long and lateral heads. It is responsible for elbow extension. The best way to emphasize this head is by doing the underhand triceps extension. The compound triceps exercises (e.g. dips, close grip bench press) tend to work the 3 heads relatively evenly. Note: All triceps exercises hit all three heads. You can’t actually “isolate” any one head. The above examples are just exercises that emphasize the muscle fibers in one head more than the others. In most cases, you shouldn’t even be worrying about emphasizing a specific head, unless you’re advanced and one of the heads is actually lagging. Otherwise, you’ll be fine doing any one or two compound triceps exercises, and which isolation triceps exercises you like (if you’re a beginner, though, no isolation is required). …This includes everything from general suggestions to very specific and seemingly trivial details – Anything that can give you a leg up. Use a shoulder-width or slightly narrower grip for all barbell triceps exercises. Lots of folks go too narrow because they think it will work their triceps better. However, that’s just not the case. A shoulder-width or slightly narrower grip provides at least as much triceps stimulation. Using grip width that’s too narrow places undue stress on your wrist and shoulder joints. Not to mention, you can’t lift nearly as much weight. Poor scapular (shoulder blades) health can indirectly slow down your triceps gains. Good scapular health is necessary to perform most triceps exercises properly and safely. Stand up with a shoulder-width stance. Look straight ahead, tilt your pelvis up, tighten your abs tight and maintain a neutral spine. Extend both arms out in front of you body with your fingers outstretched and your palms facing down. Rotate your arms to the outside so your elbows face down and your palms face each other. Your arms should be a shoulder-width apart. Maintain this distance throughout the test. Raise your arms straight up as high as you can get them. No cheating! The goal is to make your arms perpendicular to the floor. If you can do this without with minimal effort, then you’ve got nothing to worry about. Congrats! …Failure on this test indicates that you have poor upward scapular rotation, which you can improve by strengthening your lower trapezius, middle trapezius and serratus anterior. Poor shoulder flexibility is another factor that commonly contributes to failure on this test. The shoulder dislocations exercise helps to fix this. Maintain a neutral spine during triceps training. Don’t arch or extend your back, or otherwise modify your posture or stance in such a way that helps you lift more. You’re not doing Olympic lifts, training your bench press or doing other power movements. You are simply doing triceps exercises. Your main goal is to stimulate the triceps as effectively as possible. Modifying your posture or stance to maximize how much you can lift – even if done in a way that isn’t unsafe or blatantly cheating – detracts from this goal. You’ll target your triceps more effectively by tucking, or rotating your elbows in, on every triceps exercise. This diverts the focus from the triceps to other muscles (e.g. chest, deltoids) and puts excess stress on your shoulder joints. The best approach for training your triceps is to prioritize the compound triceps exercises (e.g. close grip bench press) over the isolation triceps exercises (e.g. triceps extensions). This way you maximize the extent to which you can stimulate and overload the triceps muscles. …Obviously doing compounds before isolation movements reduces how much you can lift on the isolation movements. But your overall potential for overloading the triceps is much greater than doing isolation work first. Just as it’s generally better to prioritize compound triceps exercises over their isolation counterparts, prioritizing triceps training over training for other muscle groups can be similarly beneficial. For example, if you have a dedicated arms workout day, then you could set it up in such a way that you do triceps exercises before biceps and delts. This way you’re fresher, more energized and stronger when training triceps. Whereas, you’d be tired and your triceps would be partially fatigued if you worked your triceps last. As a result you’d be weaker and less able to sufficiently overload your triceps. Drop sets for triceps are an effective technique for pushing the triceps to the limit. They allow you to achieve as much muscle overload as possible, and they bring a new level of focus intensity to your workout. If you don’t know what a drop set is, let me explain: It’s when you do a set of an exercise to failure, reduce the weight by a large percentage (i.e. 30-50%) immediately and then proceed to do another set to failure. Drop sets shouldn’t be done for all sets of all triceps exercises. I’ll do 1-2 drop sets at the end of each of the last 2-3 triceps exercises in an arm workout. This way I avoid fatiguing my triceps too much, too early. Your triceps can stagnate in terms of size and strength if one side is significantly weaker than the other. So, if your left triceps is a lot weaker than your right triceps, it could be holding back your overall triceps development. This can happen from doing only barbell exercises (or 2-handed dumbbell exercises, such as dumbbell triceps extensions) where your dominant side can always compensate the weaker side. Over time, the imbalance grows until the it is so large that you stagnate. The stronger side can no longer compensate for the weaker side, and the weaker side can no longer contribute sufficiently to the effort. To fix or prevent this, you need to train each side independently. This means doing unilateral (one-side) and bilateral (two-side) triceps exercises. Examples of unilateral dumbbell triceps exercise include: 1-arm overhead triceps extensions, 1-arm cable pushdowns and triceps kickbacks. Examples of bilateral dumbbell triceps exercise include: dumbbell close grip bench press and dumbbell triceps extensions. An imbalance between the left and right side of a muscle group related to the triceps (e.g. if right pec is stronger than the left pec). If this is the case, the solution is to do more unilateral and bilateral dumbbell exercises that target the affected muscle group. An imbalance between multiple muscle groups (e.g. if the rear delts and upper back muscles are much weaker than triceps, the front delts and chest). If this is the case, then you need to bring the weaker muscle groups up to par with the stronger ones. Train the lagging muscles 2-3x as much, and make a habit of doing a stretching routine for the dominant muscles. If you’re in the beginner stage, do yourself a favor and forget about doing any triceps specialization. That means no dedicated triceps or arms workouts. I don’t see an issue with about two sets of light to moderately heavy isolation triceps exercises at the end of every couple of workout. Just as long as it doesn’t effect your recovery.The purpose is to quench the self-indulgent urges to do direct arm work – which are incredibly prevalent tendency among newbies, and I was no exception – without actually interfering with your progress. Body Part Split. Doing a 4- or 5-day body part split routine is the best training approach for prioritizing the goal of building bigger triceps. The downside is that it’s not as conducive for increasing strength as other types of routines. If you go with this approach, I recommend 1 or 2 days dedicated to upper arm training, with an emphasis on the triceps over biceps and shoulders. If you choose to do two arm workouts, one workout should be more intense. The other one should be less intense, but still challenging. Also, be sure to space the arm workouts 3-4 days apart to allow for maximum recovery. Whether you do 1 or 2 weekly arm workouts, aim for 10-15 total sets of triceps exercises. Upper Body/Lower Body Split. A 4-day upper body/lower body routine is another top choice for an effective triceps training approach. It would include 2 days where you incorporate a bunch of triceps sets. I’ve personally had great success doing routines like this, where one of the upper body workouts is dedicated to hypertrophy (more isolation work, around 7-12 reps per set) and another dedicated to strength (more compound work, around 4-6 reps per set). 5-7 sets of triceps for each upper body workout is a good starting point. Though not as optimal as the above options, integrating a significant amount of triceps work into other types of training regimens is certainly possible. Weave-in a few sets of triceps work to each workout. Modify exercises to target the triceps better (e.g. bench → the close grip bench; chest dips → triceps dips; shoulder press → elevated-feet triangle push ups). Emphasize the triceps on the push day by increasing the number of sets of triceps exercises. Train triceps earlier in the routine. I’d probably also add triceps work to legs day. This page should have gotten the ball rolling for you. Just came to know that parallel dips and bench dips proved to be the best exercises for triceps. Wasn’t seeing my triceps grow, when i started doing more compound movements and saw huge difference in short time.